In lieu of flowers memorial donations may be made to Coal Hill Community of Christ or Coal Hill Cemetery and left at the funeral home. 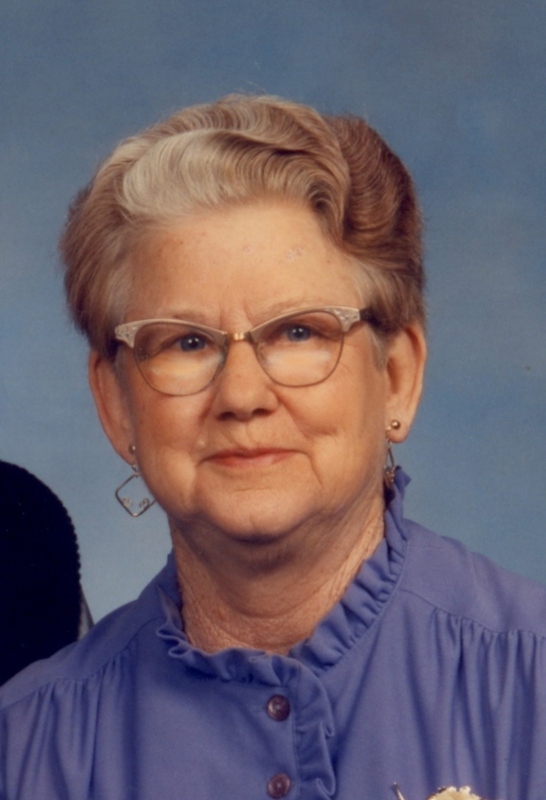 Viola Wood, age 92, of El Dorado Springs, Missouri, died December 22, 2011 at Freeman Hospital in Joplin, MO, from complications while battling pneumonia. She will be greatly missed by her family and friends. She was born January 24, 1919, in St. Clair County, MO, daughter of John and Charlotte (Hutton) Williams. Her given name was Myrtle Viola Williams but as a child she decided to be called by her middle name, Viola. She had a half-brother, two brothers and five sisters who reached maturity and a half-brother and a half-sister who died as children before she was born. Her family lived in Cedar Springs, MO, for several years where they ran a general store until they moved to Roscoe, MO, about 1930. Viola attended grade school at Cedar Springs, MO, and high school at Roscoe, MO. She married Wallace Wood on January 3, 1936. They had four boys, Kenneth, Richard, Dennis and Shelby. After they were married they lived in the El Dorado Springs vicinity all of their lives except for one year in Colorado during the Great Depression when they could not find work locally. Wallace and Viola were a hard-working team and frugal with their hard-earned money which was essential if one was going to make it during the depression. In the late thirties and early forties they would take a crew to Idaho for spud harvest in the fall. Viola cooked for the crew and drove the truck in the field while the crew bucked sacks of potatoes onto the truck. Around 1940 they bought a farm east of El Dorado Springs in the Coal Hill community where they made their living farming and trucking. When their boys were small and later when they had left home, Viola worked in the fields beside Wallace helping bale hay, clear brush, milk the cows, and feed the hogs and cattle. Those times when Wallace was on the road hauling grain, Viola ran the farm with her sons' help. As a farm wife, Viola took care of household chores, raised chickens, gardened, canned, and sewed. She was also a good cook -- some may remember when she sold glazed doughnuts to earn extra income. She took on the difficult task of refinishing their upright piano and, rather than buying new furniture, she reupholstered the living room furniture. Viola enjoyed making quilts and was an avid reader. Viola stayed on the farm after Wallace's death in 1999 until she moved to the nursing home in 2009. Viola was baptized in 1938 into the Reorganized Church of Jesus Christ of Latter Day Saints (now Community of Christ) and was a faithful member of the Coal Hill branch until her death. Over the years she served the Coal Hill branch as women's leader, Sunday School teacher and branch recorder. She loved to read and study the Scriptures. Wallace and Viola loved to dance in their younger days to the great consternation of Wallace's mother. Over the years, Wallace and Viola traveled across much of the United States sightseeing and visiting relatives. In later years they enjoyed having music get-togethers with the Wood family to sing gospel songs. Viola was preceded in death by Wallace, her husband of 63 years. Of the Williams family she was preceded in death by her parents John and Charlotte Williams, her siblings and their spouses: Elbert (Thelma) Williams, Forest (Lorene) Williams, Beulah (Louis) Smith, Rhoda (Joseph) Budd, Lyda (Wallace) Mann, Leatta (Harley) Overton, Irl (Blanche) Williams and Ruby Dell (Ray) Mann. Of the Wood family she was preceded in death by her parents-in-law John and Myrtle Wood, Wallace's siblings and their spouses: Pauline (Ray) Gerber, George (Fern) Wood, Lavern Wood, Loren (Henrietta) Wood, Eunice (Ray) Fox. She is survived by her sons and daughters-in-law, Kenneth (Loretta) Wood, Richard (Betty) Wood, Shelby Wood all of El Dorado Springs, Dennis (Sharon) Wood of Olathe, KS; seven grandchildren, Randall (Laurie) Wood of Joplin, MO, Daniel (Lisa) Wood of Greenwood, MO, Waylon (Esther) Wood of Houston, TX, Craig Wood, Eric Wood, Linda Wood and Colby Wood all of El Dorado Springs; eleven great-grandchildren and one great-great grandson; sister-in-law Evelyn Wood (wife of Lavern) of Odessa, MO, and numerous nephews and nieces. Visitation was held Tuesday, December 27, 2011, from 6-7 p.m. at Bland-Hackleman Funeral Home, El Dorado Springs, MO. The funeral service was Wednesday, December 28, 2011, at 10:00 a.m. at Bland-Hackleman Funeral Home followed by interment at Coal Hill Cemetery. Elder Chad Reynolds officiated and Terry and Ron Hubbard provided music. Arrangements were under the direction of Bland-Hackleman Funeral Home. Pallbearers were: Randall Wood, Eric Wood, Waylon Wood, Craig Wood, Daniel Wood, Colby Wood, and Linda Wood.